Welcome to a brand new addition to the Puzzle Book family - the personalised notebook! 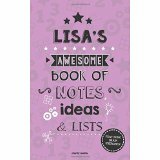 Perfect for those who love taking notes, this book also contains many fun puzzles to occupy your mind alongside lots of blank pages for you to write your notes on. Either buy one for yourself as a gift, or if you know someone who loves taking notes or writing lists, why not treat them to one at their next birthday or even as a stocking filler at Christmas time? The book contains over 100 pages of lined note paper and is in a handy pocket size. The personalised notebook is available in a large range of names, which is being added to all the time. If you don't see the name you want below then just let us know via our Contact Us page and we can get it created for you at no extra charge!